1. Manual loading moves board onto table of registering section. Table starts vacuum to fix board on table (vacuum controlled by HMI), table starts left /right moving and takes board to printing section. 2. 4 sets CCD camera hunt the marks and feedback to control system. If location deviates, X/YIY stepping driver system starts to move table with board to correct location. 3. 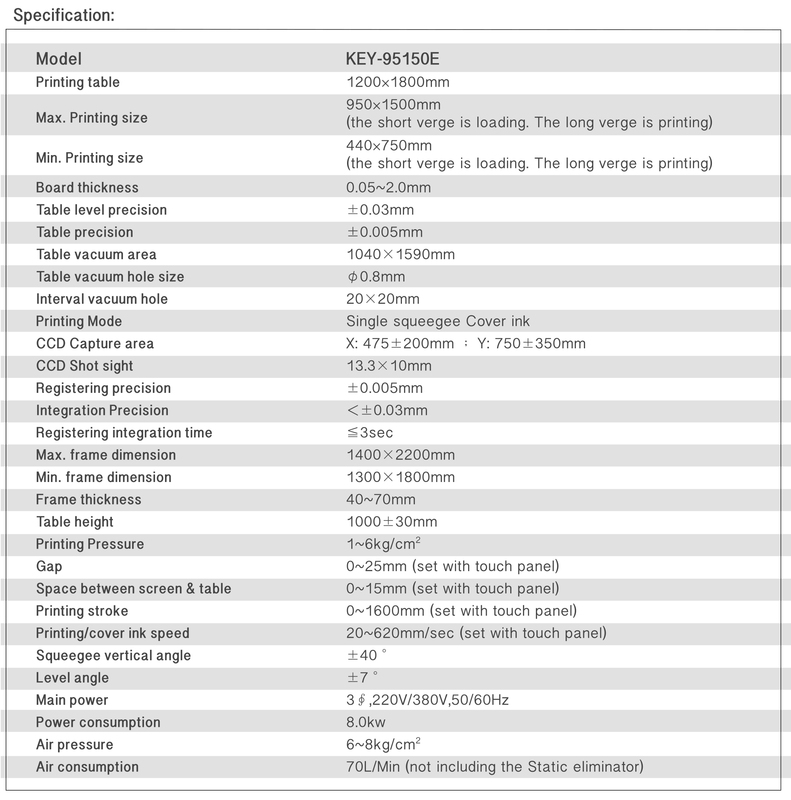 Japan made servo motor control printer: linear / HMI setting speed and stroke of printing and cover ink speed / manual setting squeegee & scarper depth - angle ' vertical angle work with digital constant pressure device for constant printing pressure. 4. Japan made servo motor + printing & gapping at same time : Gap height or start delay can be controlled by digital. 5. 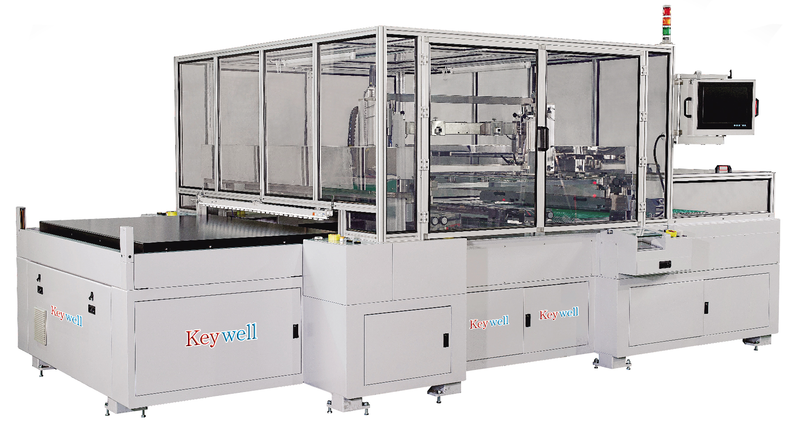 Digital control screen frame printing sect up / down : space between table and screen are digital controlled with Japan made servo motor + chain drive 4 shaft up / down synchronized for stable printing precision. 6. 4 sets Japan made servo motor : table moving left/right (1set) - squeegee seat forward / backward (2set) - printing head forward / backward (1set). 7. 3 sets USA MDRIVE stepping motor: CCD table X/Y/Y axial moving. 8. 2 set Japan made servo motor : space between table and screen controlled by servo motor + chain to drive 4 shafts rising at same time for precision of printing location. 9. PLC: Connect and control above digital driver and control system. Input/output connection reserved for front/rear section integration. 10. HMI : operate conveniently and various parameter setting - detail display.Having 100 sets memory address of operation mode, just touch some switches to easy memory. back the setting mode that can reduce the installation time. 11. CCD enlarges marks for analyze and compare. Image resolution up to 0.4 um and works with X/Y/Y stepping motor driving table to achieve registering precision up to 5um.